It's official, I love Closet Case Patterns! Eventually I believe I will make all of them! I've already made the Clare Coat, Fiona Sundress and Amy Jumpsuit. 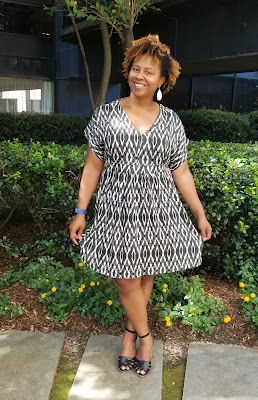 I also have the Ginger Skinny Jeans, Sasha Trousers and Kalle Shirtdress in my pattern collection, but my latest make is this mini length Charlie Caftan. It was difficult to decide which view to make. I like the architectural look of View A and knew Fabric Mart's designer quality linen would provide the perfect structure. On the other hand Fabric Mart typically stocks a lovely assortment of challis and it is one of my favorite fabrics. Ultimately I decided that flow-y would beat out structured (this time). Despite the fact that fall is approaching I decided on the shorter version (but added the ties) and will just wear the heck out of it for the next several weeks. I used this beautiful gray and white diamond print challis which has a super soft hand! This is going to be so comfortable to wear. The listing accurately describes the fabric as translucent, but with the loose floaty feel and front gathers I am not concerned about anything showing. I'll be honest I was a tad concerned about installing the panel. Looking over the instructions reminded me of welt pockets instructions, which I've never sewn because they seem tricky. Thankfully the instructions were clear and installations was a success (though not perfect). 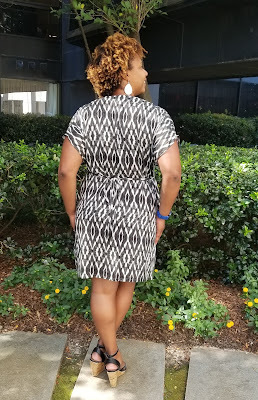 I followed the sewing machine instructions for enclosing the panel on the inside of the dress because I hate hand sewing, but the instructions walk you through both options. Closet Case also has a blog post on the panel installation which includes step by step photos in case you need extra help. Everything else is really a breeze. I'm super pleased with how it turned out and now I know I need Views A and C too. This looks great on you! Your fabric selection is perfect for this pattern, too. 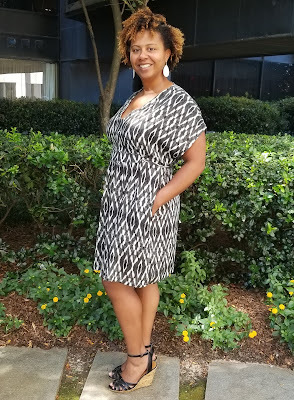 Beautiful, I love your fabric choice and the fit is awesome!!! !